While some scholars are now considering an autumnal dating instead of 24 August in the year 79 C.E.,  one of the discussions focuses on the harvest gatherings of fruits and other plant material found–at Pompeii and the surrounding Campanian area–which were trapped in time during the eruption. These would include items such as ‘pomegranate, chestnut, dry figs, raisin grape, pine cone, dates,’  among other things. For example, at Oplontis in the villa of L. Crassus Tertius, traces of autumnal fruit, such as grain residues from grapes were discovered. Another indication from Oplontis leaning towards an autumnal date, many stalks with residue, from a harvest in progress, were discovered around the winepress of the country villa of Terzigno. Though, there is some evidence which favors a summer eruption. At Herculaneum, nuts in large quantity, hulls, almonds, figs and other edible material were found. Ciarallo and Carolis indicate that the almonds mature at the end of August and that figs ripen at the end of the month as well. These things, among other details, favor a summer dating. Although there seems to be a mixture of evidence from the fruits and various plant material, other evidences need to be investigated. It is known that at Pompeii casts of the dead reveal evidence of wearing heavy clothing and fabrics at the time of the eruption; at Herculaneum a skeleton was found with a fur cap. Could these discoveries favor an autumnal dating? Surely this would indicate that it was a time of year when it is cold and, therefore, people were wearing heavier clothing. This would hardly make sense with a hot summer day. On the surface, this seems to be a plausible case for an autumn time period, but one must further evaluate the circumstances. At the time of the eruption, falling debris of pumice and ash certainly would have caused inhabitants to take necessary safety precautions. In Letter 6.16, Pliny writes that his uncle and others tied cushions on their heads with sheets for protection against the falling pumice debris as they were fleeing from unsafe buildings (6.16.16). One can infer that others found with heavy clothing would have intended the same—such clothing for protection. However one views the circumstances, it seems the clothing evidence would be inconclusive whether it was a summer or autumnal eruption. On the one hand, if it was on a hot summer day in August, the circumstances of the eruption may have prompted the people to wear protective clothing. But on the other hand, if it was in the autumn, the heavy clothing could have been used for colder weather, for protection, or both. Although these matters concerning fruits, plant material, and clothing all remain debatable for discussion, there is further evidence which may lead to more determinative support of an autumnal eruption. We’ll look at this in more detail next time! E.g., Pappalardo, Berry, Beard, Rolandi, Paone, Lascio, Stefani, and others. Annamaria Ciarallo and Ernesto De Carolis, ‘La data dell’eruzione,’ Rivista di studi pompeiani 9 (1998): 65. The dating of the eruption in the codex reads as nonum Kal · Septembres (24 August), which standard texts of Pliny’s letters include. 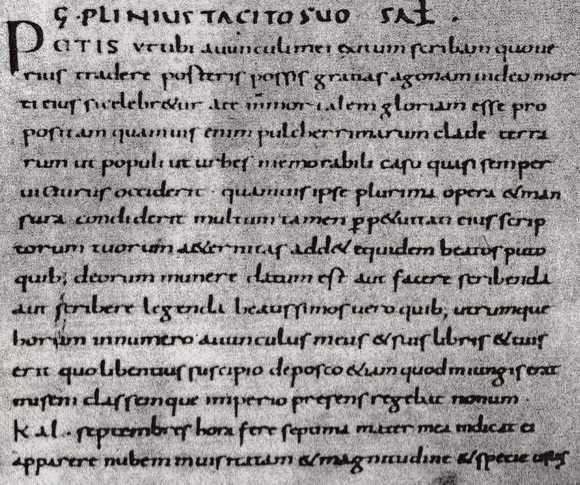 One critical text, following the usual date, footnotes in its apparatus Septembres as coming from manuscript M (Mediceus), but the reading is omitted in another medieval manuscript, γ (codex Veronensis deperditus). Although the manuscript citation is brief, this is another indication that the conventional dating of 24 August relies entirely on the reading in the ninth century codex M. This certainly raises uncertainty concerning the date widely accepted, especially when it is dependent upon one late codex within a number of medieval manuscripts which are not homogenous concerning the dating of the eruption of Vesuvius. One, therefore, must look further into other evidences to gain a more accurate picture of the dating. C. Plini Caecili Secundi: Epistularum Libri Decem, R.A.B. Mynors, ed. (Oxford: Clarendon, 1963), 174. Unfortunately, no other critical notes are given in this edition, except that a (editio Aldina anni 1508) follows M.
This is the first in a series on which I’ll be posting. In many publications, we read that the eruption of Mt. Vesuvius happened on a hot summer day in August of 79 C.E. (see, e.g., Wiki under Eruption of AD 79). Recent research, however, is beginning to challenge this traditional view with a later date in the autumn of that year. If this is so, this may paint a more accurate picture of the chronology of the disastrous events which took place in the area of the Bay of Naples in the year 79. I will survey (surveys usually cannot do it justice!) some of the evidences which reveal a more determinative view for an autumnal date for the eruption. Some of the items for discussion are Pliny the Younger’s account of the eruption (Letter 6.16), autumnal harvests, clothing, literary, numismatic, and inscriptional evidences. On 24 August, almost the seventh hour, my mother points out to him (Pliny’s uncle) that a cloud appears of both an unusual size and appearance. Nonum kal. Septembres hora fere septima mater mea indicat ei apparere nubem inusitata et magnitudine et specie (Pliny, 6.16.4). Pliny’s extant letters of the eruption and his uncle’s death during the rescue are letters 6.16 and 6.20. For a printed Latin-English edition see Pliny, Book VI in Letters, Books I-VII, vol. 1 (Loeb Classical Library. Cambridge: Harvard University Press, 1969). A.N. Sherwin-White, The Letters of Pliny: A Historical and Social Commentary (Oxford: Clarendon Press, 1966), 372, writes that this dating is dependent upon Pliny. A Day in Pompeii (Seattle: Documentary Media, 2007), 4. Casually browsing another popular-level work, by Benedicte Gilman, Ashen Sky: The Letters of Pliny the Younger on the Eruption of Vesuvius, illustrated by Barry Moser (Los Angeles: Getty Museum, 2007), one can easily find the traditional August dating (7, 8, 9, 11). Many more examples can be given, but these are simply two current examples. A few examples, Umberto Pappalardo, ‘L’eruzione pliniana del Vesuvio nel 79 d.C.: Ercolano,’ in Volcanology and Archaeology, Pact 25, C.A. Livadie and F. Widermann, eds. (Strasbourg: Council of Europe, 1990), 210; Joanne Berry, The Complete Pompeii (London: Thames & Hudson, 2007), 20; Mary Beard, The Fires of Vesuvius: Pompeii Lost and Found (Cambridge: Belknap Press, 2008), 17. Berry, 20. G. Rolandi, A. Paone, M. Di Lascio, and G. Stefani, ‘The 79 AD Eruption of Somma: The Relationship Between the Date of the Eruption and the Southeast Tephra Dispersion,’ Journal of Volcanology and Geothermal Research 169 (2007): 94, note that the manuscript indicating the date 30 October is ‘now lost.’ See the Wiki article under ‘Date of the eruption’ for a reference to this research. The article abstract and PDF purchase can be found here. Blogging has been practically non-existent here for quite a while. 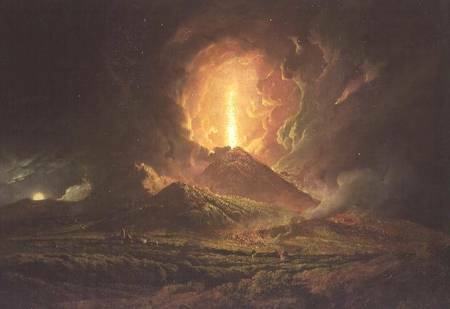 But I’d like to start a series of posts on the dating of the eruption of Vesuvius in 79 CE. I’ve done a little research on it and I’ll be sharing some of it here in a snippet series. Hopefully, by doing this, it will get me back into the swing of posting here.